So – here are some handy dandy acupressure points you can use for yourself. In all cases, press firmly with a fingertip for a few seconds, on both left and right sides. LI-4 is great for all colds and flus, especially if you have sinus pressure or a fever (do not use if pregnant!). TB-5, below, is an immune booster – it’s two fingers past the wris t crease on the back of the forearm. 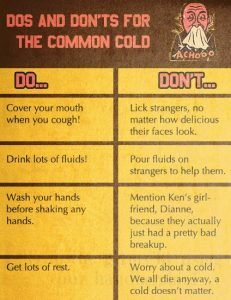 ST-40 is an anti-phlegm point. Press on TB-17, just behind and below the earlobe, if your ears are plugged. 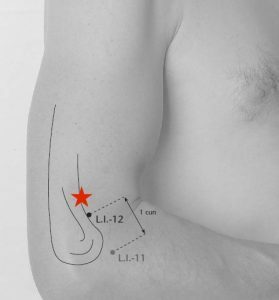 If you are JUST starting to get sick, try the point below, where the red star is, on the edge of the bone above the elbow. It has a brief window of usefullness and it’ll be sore if it’s active. Drink lots of fluids. Remember to eat a little protein, to help your immune system make anti-bodies. Chicken soup made with bone broth is legendary for a reason! Add some garlic for an bonus boost. Get up and move around now and then, even if it’s just for a few minutes every few hours. That helps your lymphatic system pump the immune response through your body. Try to avoid dairy and alcohol – they are both Damp and will produce more phlegm. *They may have immune disorders, or non-contagious diseases that require immune-suppressing drugs.